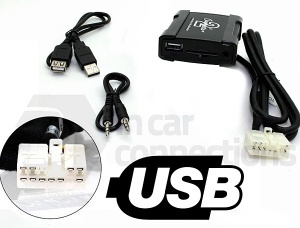 Toyota USB adapter interfaces for Toyota Avensis, Corolla, RAV4, and Yaris. Connect USB devices such as portable hard drives and USB memory sticks full of your favourite MP3 music files and play the audio through your Toyota factory fitted car stereo. It is also possible to connect an iPod, iPhone or any other mobile phone via the 3.5mm jack AUX input. Suitable for Toyota models with the standard factory fitted car radio models. Toyota USB adapter CTATYUSB001 for Toyota Avensis Corolla and RAV4. Connect USB devices such as portable hard drives, USB memory sticks and SD cards full of your favourite MP3 music files and play the audio through your Toyota factory fitted car stereo (up to 2004 with 5+7 pin connector). 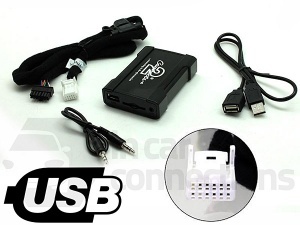 Toyota USB adapter CTATYUSB002 for Toyota Avensis Corolla RAV4 and Yaris. Connect USB devices such as portable hard drives, USB memory sticks and SD cards full of your favourite MP3 music files and play the audio through your Toyota factory fitted car stereo (2004 onwards with 6+6 pin connector).